It’s been awhile since I last reviewed the work of Dulcet Jones and I’m thrilled to announce his return to the world of spooky atmospheric music. Also returning is his daughter Natalie, who has once again provided the cover art. But there is one thing which isn’t returning: the relaxing tracks that aren’t scary. This year marks his first album that’s spooky from start to finish! The title track “Horror, I’m Afraid” is comprised of unearthly electric effects and harpsichord-like notes with touches of guitars. Said effects reminds me of theremin work at some times and chirping at others. The fluting dirge and light touches of “Electric Requiem” do little to cut down on the overall mournful feel of the guitar work. One brief segment has a self-reflective nature to it, but it’s mostly odd and foreboding. It’s a good way to throw people visiting your haunt off guard, either in a funeral parlor scene or any scary setting. “Gunslingers Ghost” is like the opening theme to a western, only with a somewhat macabre surf twist. Despite its minor surf influence, it’s fairly slow in terms of pacing. Not that I’m complaining. I love the tolling bells and drum beats in this. Some portions even remind me of galloping hooves. Be sure to play this at the entrance if you have a ghost town theme for your haunt. “Evil Robot Army” brings us steam-like touches and clanking metal over a creepy backing guitar. There’s plenty of interesting musical variations thanks to the “steam” parts. It’s a perfect fit for a steampunk haunted house, haunted boiler room or factory scene. The presence of the harpsichord in “Blood Ritual” provides an ancient, regal feel. This in turn makes for an interesting combination with the guitar work and other unusual touches. For example, having the guitar play us out was an interesting touch. This seems better for throne rooms rather than cult scenes despite what the name implies. “Hurriquake” is named for an imaginary disaster. That’s why you can hear so many alarms and rain. There’s also rumbling thunder, banging shutters and electrical effects with a loud, steady percussive beat acting as the foundation. Not only that, but the wind even takes on ghostly feel at end! The inclusion of sirens could also allow for its use in an industrial or chain maze and you could even make a room based on the track’s title. Cutting different lengths of fishing line and hanging them against black fabric in a window can create the illusion of rain (adding some glass beads will add extra realism) and a strobe light or lightning machine will bring in the lightning. The old shaking floor trick will act as the earthquake, which can be further enhanced by banging shutters and props that fall or tilt over during the “quake” You can even have a hidden fan turn on when the shaking starts to simulate wind blowing in through the damage created by the hurriquake. “Lurker” just screams “sneaking medieval eeriness.” I think you can guess what was used here based on what I’ve written above. Some parts remind me of falling or descending down stairs, so it can be used on stairs or with a bottomless pit effect as well. According to the artist, his plan was to write a classical guitar composition to base the track around. But once he started to fiddle around with a computer program which lets you pick what instrument to play the song back with, the guitar gradually got pushed out of the track! “Cadaver Dance” is much slower and lower key than the album’s other tracks. I love how the creepy notes linger and the wailing wind is a fantastically eerie touch. There’s snippets of “steam,” guitars and some lighter music too. The ending bells are a great spooky touch. If you want to use this in a haunted ballroom despite not having the space or resources to pull of this classic Pepper’s Ghost effect, then I have some good news for you. You can create a much simpler version of the effect in your own backyard. Just use chicken wire to make ghostly shapes and cover them with luminous paint. Then position them to look like dancers and have guests look at them through a window or from a distance outside. If you have them positioned far away enough and use paint which looks white when it’s not glowing, you could even try using a strobe light to make the ghosts appear to move. 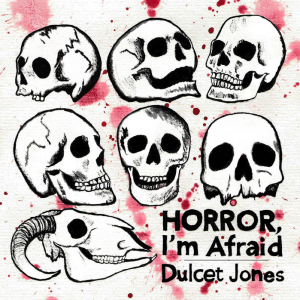 Horror, I’m Afraid is further proof the work of Dulcet Jones is truly unique in the world of haunt music. All of the tracks can be easily looped and I personally recommend picking individual tracks for use in your haunts and Halloween displays rather than playing the entire album on a loop. Unless you’re actually using props and scenes which go with the tracks. I was surprised to see how he didn’t include his 2015 single “Psychotica Fraidicus” or the SoundCloud exclusive “The Howling” (which is actually a reworking of the track “Vignette Five” from his 2002 release Dulcet Tones). I suspect this was because he wanted to offer all new material rather than recycle tracks and throwing those two into the mix would have made this album longer than the others. With that in mind, his decision makes perfect sense. Especially since both tracks are already out there and are easy to obtain for very little money. I’m already looking forward to More Horror, I’m Afraid and I’m sure anyone who listens to this will feel the same way.